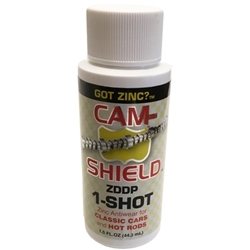 Cam Shield Oil Zinc Additive. A must for all vintage flat tappet engines. Treats up to 6 qrts of oil. Cam-shield™ Oil Treatment BEST product, BEST value to protect your investment! All conventional and synthetic oils today are made with 800 ppm or less of the critical zinc & phosphorous our vintage motors need. 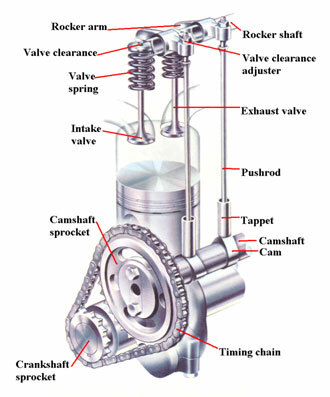 Cam-Shield will boost those levels to 1200 to 1600 ppm which meets or exceeds the needs of these flat tappet engines. Cam-shield™ brand engine oil additive provides premium ZDDP anti-wear protection for camshafts, lifters and valve trains in your classic car, hot rod or race car. Add Cam-shield™ to any conventional or synthetic engine oil to raise the ZDDP concentration to the level required for protection of historic flat tappet cam engines or race engines.